The first time I made this soup, I followed the directions from The Silver Palate Cookbook, painstakingly peeling and dicing two butternut squashes. I liked the soup, but I didn't like the effort that went into making it. So the next time, I roasted the squash first, scooped out the flesh, and added it to the pot with the rest of the ingredients — much easier! Although this recipe contains almost all the ingredients of the original recipe, the cheats are mine. Roast the squash: Preheat the oven to 400 degrees. Cover a large baking sheet with foil. Pour a tablespoon or two of oil over the foil to create a thin film. Cut the butternut squash in half, scoop out the seeds, and place each half on the oiled foil, flesh-side down. Bake the squash until tender, 45 to 55 minutes. Prep the soup: While the squash is cooking, prepare the rest of the ingredients. In a large stockpot, heat a couple of tablespoons of oil and the butter. Add the chopped onions and curry powder, and cook over low-to-medium heat for about 10 minutes, until the onions begin to soften. Add the chopped apples and cook another 5 minutes, giving the contents of the pot an occasional stir. Add the broth and the apple juice to the pot, and bring to a boil. Reduce the heat and simmer. 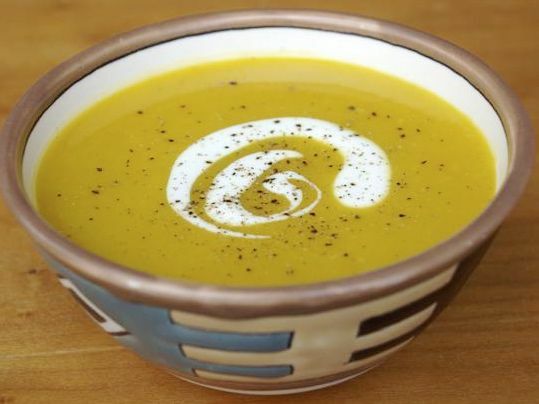 Finish the soup: Once the squash is tender, remove it from the oven and let it cool; when cool enough to handle, scoop the flesh out with a large spoon and add it to the simmering soup pot. Cook for several minutes, checking to make sure that the apples and squash are tender. Season to taste with salt and pepper and return to a simmer if the soup has cooled. If you like, garnish each bowl with a drizzle of thinned crème fraîche or floating crostini spread with goat cheese. If it's fall when you're cooking, it's worth seeking out a fresh local apple juice for this recipe.